The whole party readies themselves for the hike up the Quilcene River trail on a hot day, then revels in the shade of big trees along the route. At the first camp, the party rests and two take advantage of a mountain see-saw while others cool off in various stages in the river. Further up the trail, the flowers take center stage, as the group notes gatherings of Columbine and Indian Paintbrush (sounds of delight). Camp Mystery is chosen for the two nights of camping and tents go up at various rates of speed, transforming the area into a small village. This is followed shortly by copious amounts of food cooked and passed around by each member of the party- a veritable smorgasbord. When the food must be hung in a tree, a couple of women make futile attempts, then ask one of the men, who swiftly and accurately throws up 4 lines over a high branch. 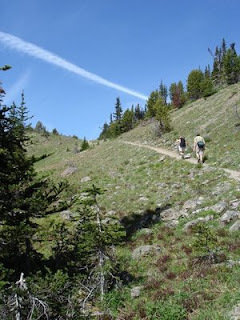 On the second day, everyone gathers up their day-hiking gear and sets out for Marmot Pass at 6,000', enjoying views and flowers on the walk. At the Pass, there are decisions to be made about the party's dayhike destination and so 3 delegates are elected to lobby for each of their chosen destinations. Views and an easy-to-attain lake are chosen and the group sets off for Buckhorn Lake. Swimmers, in various stages of undress, interrupt the fisherwoman floating around the lake in an inflatable raft. One of the guys holds the record for longest swim. One of the women is dissatisfied with the quality of the food bag rope in the tree and makes attempt to refine the way it hangs. A crowd gathers to watch the woman. The rock clears the branch but does not drop down low enough for even the tallest of the women to grab. Attempts are made with a large branch to pull the rock down, with mixed results (laughter). A different woman uses the branch with success and, in trying to put the branch down on the ground, pulls the opposite end of the rope so the rock rises back to its original height. One of the spectators falls on the ground, laughing and panting. The remainder stand and laugh but give a cheer when the pair of women have success with their rope/rock scenario. 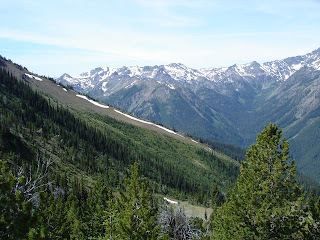 The date is the Fourth of July and a few of the party talk of going up to Marmot Pass to watch fireworks in the distance. After some peer pressure, 4 women depart up the trail, with warm clothes and headlamps. The fireworks are very small and short of spectacular but it is a beautiful night. While descending toward camp, the women hear a noise behind them and presume it is an animal but keep hiking. The woman in front turns arounds, claims she sees an animal's eyes and strides off down the trail, leaving the other three to fend for themselves. Shortly thereafter, a man with a dog and no headlamp passes them in silence. The group packs up their gear to hike out to civilization. It is only then that a few make the revelation that, against the wishes of the trip leader, they each made an excursion up to the Pass for another view. The leader is happy that they all made it back without incident and shows no emotion. The party hikes out, making one more stop at the lower camp to cool off in the river. 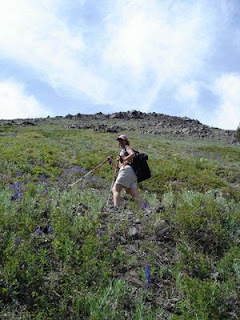 At the trailhead, there is much transformation, as most people brought a change of clothes. Hugs go all around as everyone says goodbye and gets into their cars. One car of five women gets stuck in traffic 20 miles from the ferry. By the time they reach the ferry ticket booth and the attendant tells them they will get on the next boat, they cheer and clap, just likethey did when the rope was freed in the tree. This time, though, the attendant takes a bow. For more photos of this drama, go here.